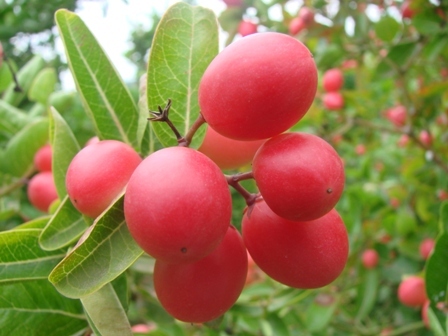 Karonda is a hardy, evergreen, spiny and indigenous shrub widely grown India. 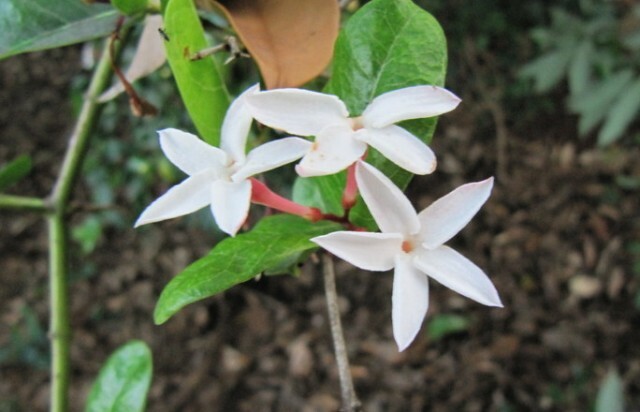 It is also found wild in the states of Bihar, West Bengal and many parts of South India. It is grown commonly as a hedge plant. Regular plantations of Karonda are very common in Varanasi district of Uttar Pradesh. Fruits, sour and astringent in taste, are a very rich source of iron also containing good amount of vitamin C. Karaunda is very useful in curing anemia. The fruits have antiscorbutic properties also. Since Karaunda is a very hardly and drought tolerant plant, it thrives well throughout the tropical and subtropical climates. Heavy rainfall and waterlogged conditions are not desirable. It can be grown on a wide range of soils including saline and sodic soils. There are no well- established varieties of karaunda. Cultivated types are classified on the basis of fruit colour e.g. green-fruited, whitish fruits with a pink blush and dark purple fruited. Narendra Selection 13, 16, 12 and 3 have also been identified as promising. Recently a new promising selection of this fruit, which has been named as Thar Kamal, has been made at the Central Horticultural Experiment Station, Vejalpur, Gujrat by Sanjay Singh and his colleagues. Karaunda is commonly grown from seeds. Vegetative methods—air- layering and stem (hard wood) cuttings are feasible but not very common. Fresh seeds are sown in nursery during august –September. One- year old seedlings are transplanted. Air- layering is very successful in karaunda. It can be performed in the beginning of the monsoon. Rooted layers can be separated 3 months after layering. Pits of 60 cm x60cm x 60cm size are dug and filled with organic manure and soil, in a 1:2 ratio. The planting distance for fence/ hedge should be 1-1.5 m, requiring 300-400 plants for planting along the boundary of one hectare field. If an exclusive planting is to be raised, a planting distance of 2 m x 2 m should be enough. Karaunda plants grown as protective hedge are hardly manured or fertilized. Manuring, however, is beneficial. Otherwise its plants slowly get exhausted after taking 2 crops and start showing symptoms of die back. Therefore, 10-15 kg well-rotten farmyard manure or compost/plant should be applied before flowering. Since karaunda is a hardy plant, it requires very little care. Suckers appearing from the ground in regular plantation must be removed timely. Hoeing is essential for removing the weeds. Seasonal vegetables can be intercropped in first 2 years of regular plantation. Water requirement of Karonda is very low. Irrigation after planting and manuring is essential. Plantation once established does not need much water. However, if there is no rain during the development of fruit, one irrigation may be given. This will increase the fruit size. Plants raised by seed, start bearing in third year of its planting. Flowering takes place during March. The fruits ripen from July to September in north India. Under arid conditions, the flowering starts late and fruits ripen after the monsoons. Karaunda requires 2-3 pickings to harvest the entire crop. On an average, a plant provides 3-5 kg fruits. Karaunda fruits mature 100-110 days after fruit set. At this stage fruits develop their natural colour. Fruits ripen after this stage, taking about 120 days (after fruit set) when they become soft and attain dark purple/maroon/ red colour. There is no standard practice for grading and packing of fruits. After harvesting, these are kept in shade. Undesirable or blemished fruits are sorted out. Good fruits packed in baskets are marketed. Storage life of fruits depends upon the stage of harvest. 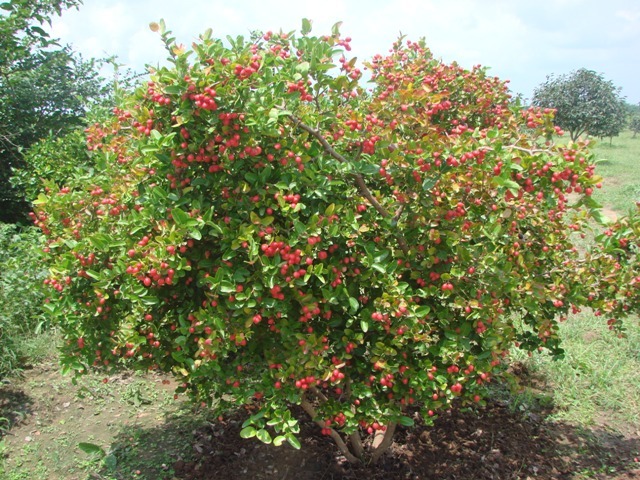 Fruits harvested at maturity, can be stored for a weak at room temperature, whereas fruits harvested at ripe stage, are highly perishable and last only for 2-3 days. Fruits can be preserved / stored for 6 months in SO2 solution (2,000ppm). Raw or mature fruits are the most suitable for pickle making, which is liked very much all over the India. These can also be used for making jelly and candy. Ripe fruits can be processed into a squash, syrup or a ready to serve bottled drink. They can also be dried.